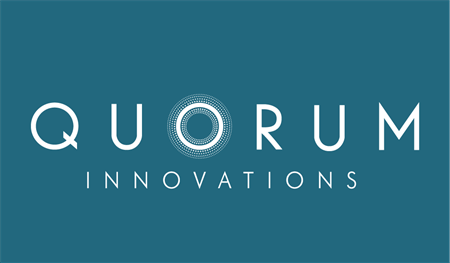 PRNewswire/Sarasota, FL, October 27, 2016– Quorum Innovations today announced a major milestone that includes a drug discovery platform to advance the introduction of new treatments for skin, GI, inflammatory and metabolic conditions utilizing human microbiome therapeutics. Other unique activities of Quorum Innovations’ ProBiomicTM Therapeutics include: reduction of inflammation, promotion of innate immune defenses, upregulation of key tissue structural proteins such as filaggrin in human skin and esophagus, and modulation of critical metabolic control genes. Furthermore, bioactivities and can be formulated in multiple vehicles, including alcohol, aqueous and lipid, have been tested and found to be stable. Unlike most other bacteria which require being kept alive to maintain effect, Quorum Innovation’s bioactives maintains activity even after heat sterilization. These characteristics enable use in a broad range of applications, from direct-to-consumer to pharmaceutical products. Dr. Nicholas Monsul, MD, CEO, and Dr. Eva Berkes, MD, Chief Science Officer, founded Quorum Innovations in 2011. Quorum Innovation’s new drug candidates are extracted from the human microbiome. This creates a new era in immunology and drug discovery. Once delivered, like native human microbiota in healthy individuals, Quorum Innovation’s ProBiomicTM Therapeutics act like microbiome-based software to direct human cells to express particular proteins within target tissues. By matching the particular ProBiomicTM Therapeutic to the desired protein effect in the chosen organ of interest, our new human microbiome-based therapeutics have the power to regulate human and human microbiomial physiology like no other therapeutic system today. Emerging research on various types of inflammation indicate direct links between many clinical conditions and a dysbiotic or abnormal microbiome. Skin inflammation causes skin barrier compromise, leading to conditions such as atopic dermatitis, psoriasis, acne and rosacea. Pharmaceutical and personal care industries are seeking better ways to prevent and treat chronic skin disorders and other inflammatory conditions by addressing the underlying microbiome imbalances associated with these conditions. Quorum Innovations’ ProBiomic™ Therapeutics have demonstrated proof of concept in ex-vivo, in vitro, and initial human clinical testing. Pre-clinical and clinical models show that these human microbiome-derived therapeutics modulate the innate immune system by rebalancing the microbiome to: 1) reduce skin inflammation as measured by IL-1a levels, 2) enhance the diversity of the protective commensal population, 3) disperse and facilitate the kill of pathogens such as MRSA and Pseudomonas, 4) prevent adhesion of new pathogens, and 5) increase production of filaggrin and other critical structural proteins. The ability of Quorum Innovations’ ProBiomic™ Therapeutics to delived these activities to local tissues results in effective, safe treatment with minimal systemic exposure.